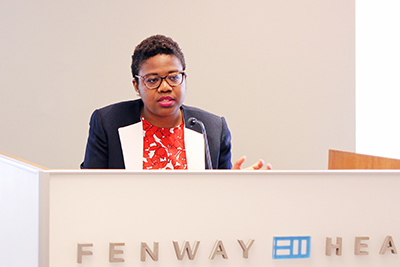 Tanekwah Hinds To Receive Boston Alliance For Community Health Award | Fenway Health: Health Care Is A Right, Not A Privilege. Tanekwah Hinds To Receive Boston Alliance For Community Health Award | Fenway Health: Health Care Is A Right, Not A Privilege. Tanekwah Hinds To Receive Boston Alliance For Community Health Award – Fenway Health: Health Care Is A Right, Not A Privilege. Fenway Health is pleased to announce that Tanekwah Hinds, Women’s Health Program Coordinator, has been selected for a Healthy Community Leadership Award from Boston Alliance for Community Health (BACH). According to BACH, the Healthy Community Leadership Award honors Bostonians who are either immigrants, persons of color, or from an underrepresented group who have taken a leadership role in a community-based coalition or organization, to help improve the health of the community and address racial and ethnic inequities in Boston. This year’s awards will be presented publicly at the BACH Annual Meeting, Tuesday, December 12, 5:30 – 8 PM at the Bruce Bolling Municipal Building in Dudley Square, Roxbury. Please join us in congratulating Tanekwah on this well-deserved honor!